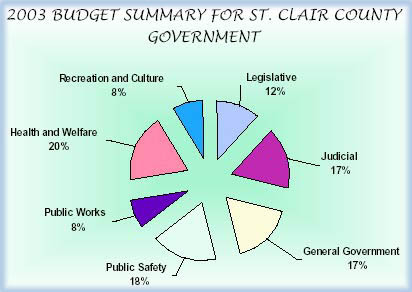 This summary of the budgets of St. Clair County has been prepared to inform the Citizens of our County of the fiscal plans of the County Board of Commissioners and Administration for the 2003 fiscal year. It is intended to inform the reader with a brief introduction to the budgets of the various activities or services which we provide. It will highlight some of the more significant changes to the budgets, define key terms used, and outline the budget process used by the County. Prepared by the Finance Department to provide a brief overview for the Citizens of St. Clair County of the budgets adopted by the Board of Commissioners. 1. The State Taxable Value of our County increased 6.3% over 2002, from $4.8 billion to $5.1 billion. 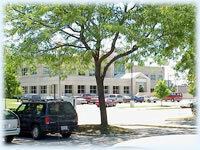 This valuation will generate approximately $26.7 million in General Fund property tax revenues in 2003. Special millages will generate another $8.8 million for their specific services. 2. General operating State shared revenues have been decreased by the State by 3.5% under the 2003 originally approved amounts. This adjustment is due to State mandated reductions in support of local government. 3. Total general operating revenues have increased 3.9% over 2002. 1. The County continues to develop and invest in the three foundational areas of human capital, corporate initiatives and capital/technology assets. The 2003 budgets include allowances for greater investment in technology to focus on the efficiency of staff and ease of access for the Citizens of the County. We are also investing in new staff positions that support current services which are directly impacted by the growth in the County. 2. Total general operating expenditures have increased 3.9% over 2002.